The demand for single-use and rechargeable batteries has significantly increased over the last decade as society switches to using more mobile products. When household batteries aren’t properly disposed, however, they represent a serious threat to the environment and public health, as well as a significant waste of recyclable materials. Proper management is especially an issue in rural areas, where scattered collection sites are inconvenient for residents. In the United States, the industry-funded take-back program, Call2Recycle, provides free collection containers and recycling services for rechargeable batteries to retailers, schools, libraries, and other municipal locations. Call2Recycle also services rural and other jurisdictions in Vermont, which recently passed the country's first single-use battery recycling law thanks in part to strong support from local governments. In this webinar, PSI's expert speakers will share tangible strategies for rural communities to increase both rechargeable and single-use battery recycling. Todd Ellis is the Director of Product Stewardship Programs for Call2Recycle, Inc., North America’s first and largest battery stewardship program, and has over 17 years of recycling and sustainability experience. Todd’s current position focuses on raising the awareness of battery product stewardship programs throughout North America by fostering positive relationships among industry stewards, stakeholder groups and sustainability experts. Also, Todd’s experience serves as a resource for battery legislation and other compliance issues integral in the product stewardship approach. Prior to joining Call2Recycle, Todd worked as a recycling planner for the State of New Hampshire, assistant director for the Northeast Resource Recovery Association and was vice president of Operations for Sprint Recycling, Inc. Todd is a graduate of the University of New Hampshire with a Bachelor of Science in Resource Economics. Note: Speaker change! Michael Olson, Director of Environmental Affairs from Sears Holdings, will be presenting for Paul Campbell. Paul Campbell is currently Director, Sustainability and Green Leadership, for Sears Holdings Corporation. 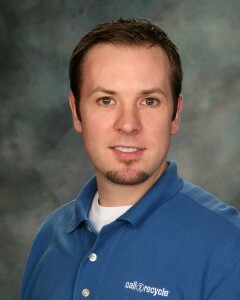 Paul began his career with SHC in 2004 as a Senior Manager, Home Services Business Development. In 2007 he was named Director, Home Appliances Operations, and led the team responsible for executing the federal appliance stimulus programs. He transitioned to overseeing strategic relationships with energy industry partners including the EPA in 2011, and assumed ownership of corporate sustainability in 2012. Prior to joining Sears Holdings, Paul worked for GE Plastics where he held roles in operations management and Six Sigma quality. He began his career in project management and maintenance reliability as part of Amoco Oil Company’s Refining Division. Paul has a BS in Mechanical Engineering from the University of Illinois where he remains an active member of its Alumni Association. Paul has served as the Executive Director of the Northeast Kingdom Waste Management District since 1999. Prior to that, he spent four years as the Supervisor for Solid Waste for the United States Antarctic Program. He has also worked as an Environmental Consultant in Massachusetts and Rhode Island. Paul has a Bachelors degree in Environmental Science from Lyndon State College and a Masters degree in Policy Analysis from the Pennsylvania State University. He has served on the Boards of the Association of Vermont Recyclers (AVR) and Northeast Resource Recovery Association (NRRA). Paul is currently the President of the Vermont Solid Waste District Manager’s Association. Suna is an experienced policy analyst and researcher with an environmental engineering background. Her role at PSI includes managing policy projects and program staff, designing and conducting research, and developing legislative strategy and policy positions. Suna’s main project focus is on household hazardous waste, mercury products, and batteries. Prior to joining PSI, Suna received her Ph.D. in Environmental Studies from York University in Toronto with dissertation research focused on the relationship between environmental policy and technology change. Suna also previously conducted recycling research at the Ames Laboratory of the U.S. Department of Energy. She holds an M.S. in Environmental Engineering and a B.S. in Industrial Engineering, both from Iowa State University. This material is based upon work supported under a grant by the Rural Utilities Service, United States Department of Agriculture. Any opinions, findings, and conclusions or recommendations expressed in this material are solely the responsibility of the authors and do not necessarily represent the official views of the Rural Utilities Service.